Millennials now make up the largest share of the U.S. workforce and employers are clamoring to attract this coveted pool of workforce talent. While many businesses focus on creating millennial-friendly work environments with ping pong tables in the break room and fringe benefits like lunchtime yoga classes, the real key to what millennials want from an employer could lie in more traditional offerings. According to a recent report from TriNet, of all age groups whose employers offer company-sponsored retirement accounts, millennials have made the most significant changes since 2012 in how much of their income they stash away. The data shows that millennials are getting savvier about retirement and are increasingly utilizing employer-offered retirement plans. 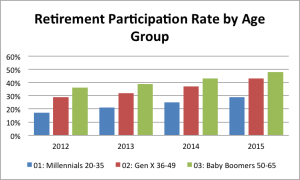 Additionally, when it comes to financial decisions impacting their future, millennials seem to be more prepared for the long haul than their predecessors in other age groups. As baby boomers are exiting the workforce, their millennial-age children are realizing how much of their parents’ retirement comfort is based on their savings decisions throughout their career. Likewise, millennials themselves are starting to have children and are reflecting on the legacy they would like to leave. In the past few years, millennials appear to be growing up and taking retirement savings more seriously. This is showing significantly through their increasing retirement contribution rates. – In 2012, 17 percent of millennials with company-offered retirement benefits contributed to their company-sponsored retirement savings. By 2015, that number rose to 29 percent. – Millennials who work for companies that offer retirement savings matching have participation rates that are 83 percent higher than those who work for companies without matching. 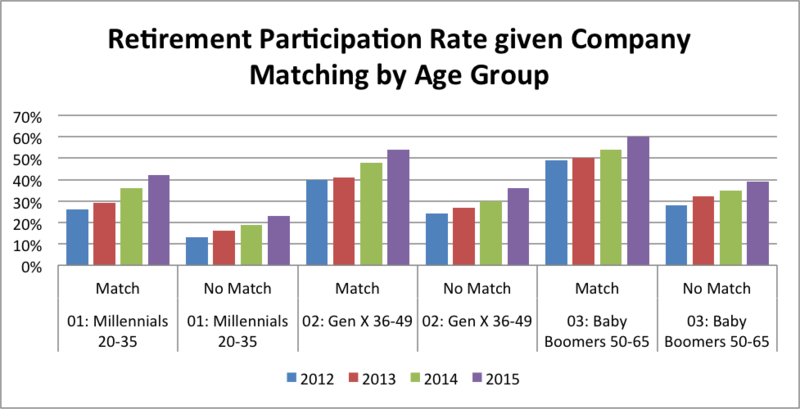 – In 2015, 42 percent of millennials participated in retirement plans with company matching, whereas only 23 percent participated in retirement savings without matching. 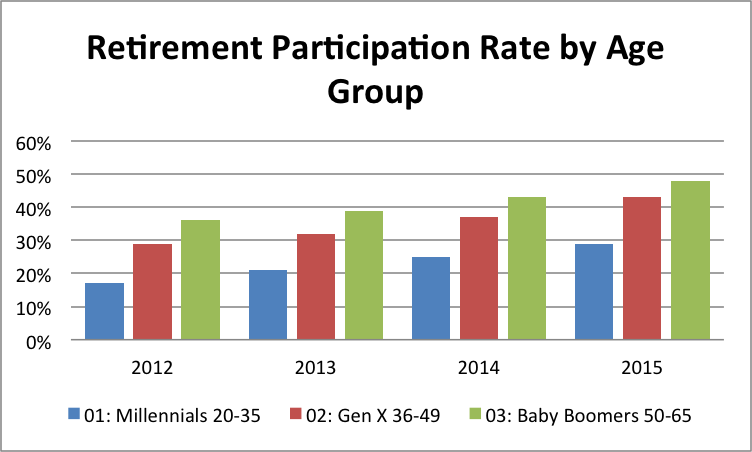 Interestingly, 2015 is the first year TriNet data shows any millennials maxing out their retirement plan contributions. This indicates that this age group is really starting to prioritize their retirement plans. 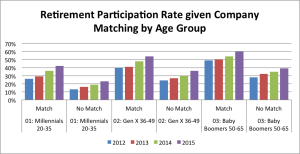 This data matches with what many experts in the HR field already know about hiring millennials – that they still want the same access to great benefits and financial security from their employer that other generations have always valued. While offering fun workplaces with casual dress codes, office games and other youth-attracting features is a reality of the millennial-dominated work environment, it can never replace the value of a good old-fashioned 401k plan. From time-to-time we have guest bloggers post on our site. 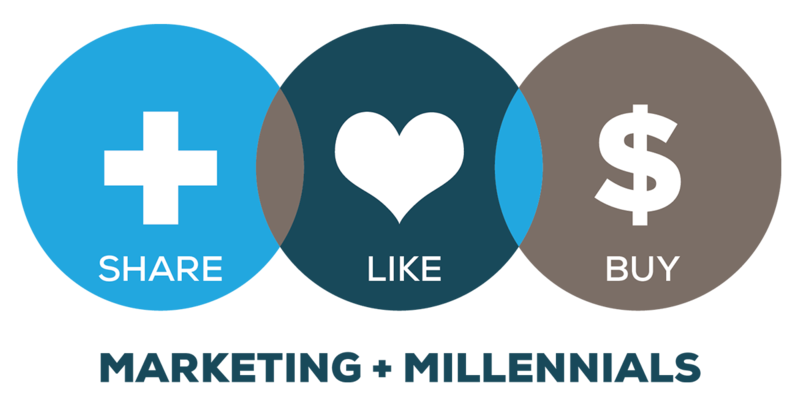 The views, opinions and positions expressed within these guest posts are those of the author alone and do not represent those of millennialmarketing.com. The accuracy, completeness and validity of any statements made within this article are not guaranteed. We accept no liability for any errors, omissions or representations. The copyright of this content belongs to the author and any liability with regards to infringement of intellectual property rights remains with them. Kyle Hubbard is an information services manager for TriNet, where he specializes in analytics and data- driven product development. Kyle uses advanced statistical techniques and machine learning algorithms to create products that help our clients...See Kyle's full bio.